We headed out from the Glass Window Bridge and motored through Current Cut with no problems. 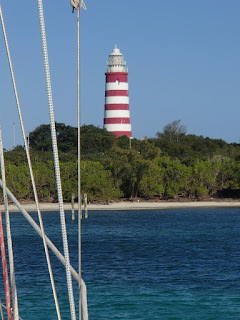 Once through we pulled out the genoa and sailed across to Spanish Wells. 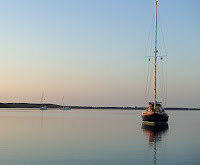 Since it was quite calm, we decided to anchor outside the harbor and took the dinghies into the wharf to tie up and visit the town. 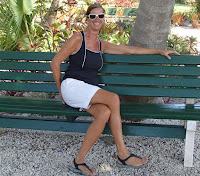 We enjoyed a Klondike bar while walking the streets just looking at the houses and going into a few of the stores. 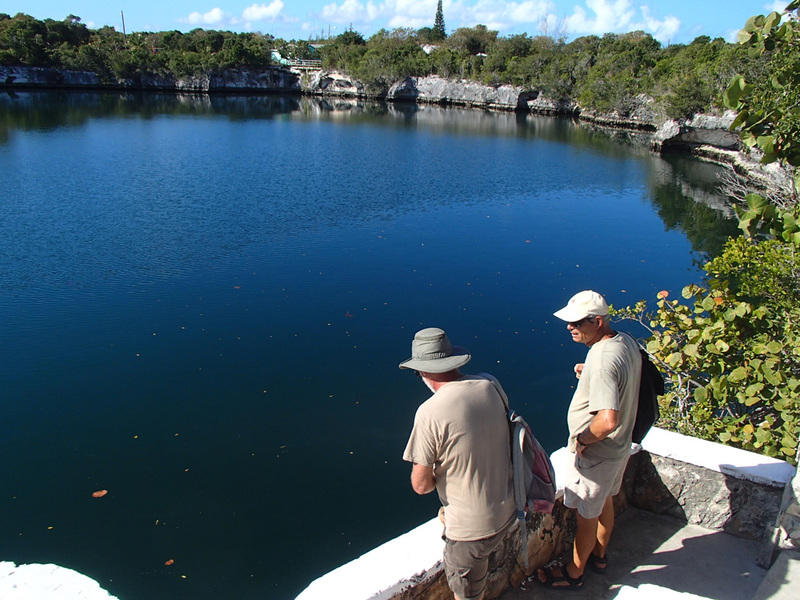 We had been to Spanish Wells probably six years ago and we had not seen any big changes. 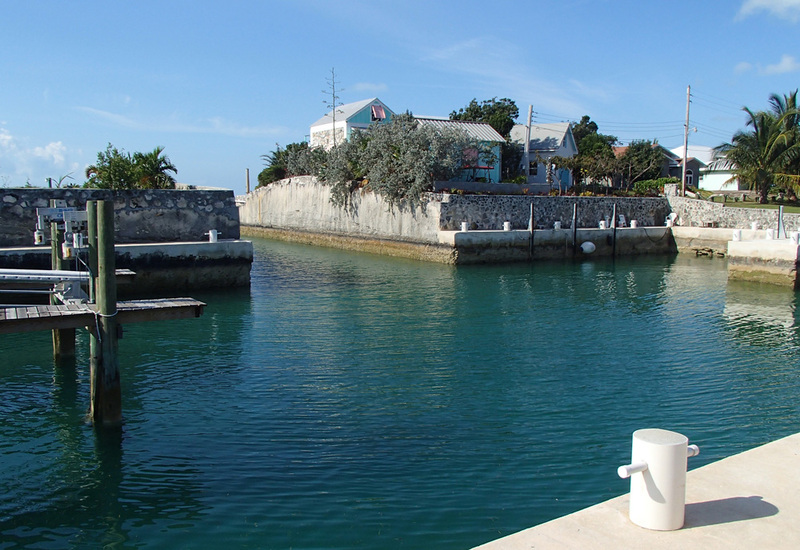 This is a fairly wealthy island, the men having made their money in fishing in past history, so the houses and businesses are a bit more “Americanized” that other islands. Their work ethic is strong so they have done better than many Bahamians. 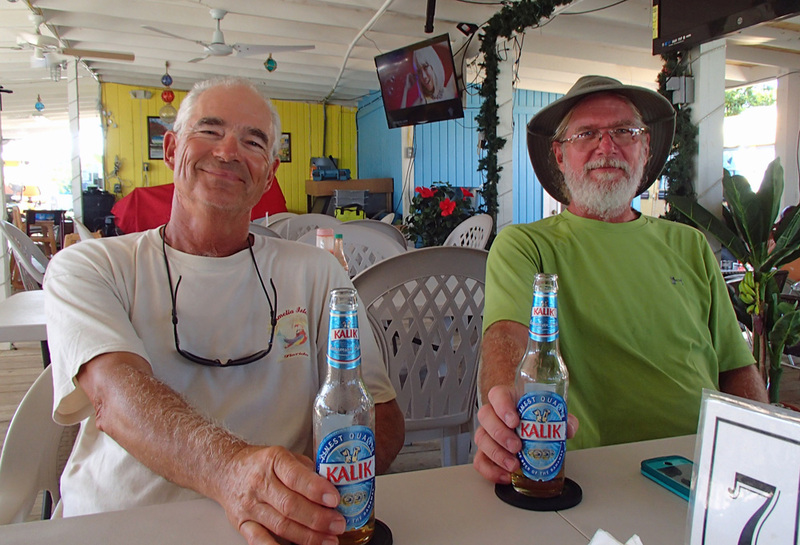 Al and George enjoying the Bahamian beer, Kaliks. 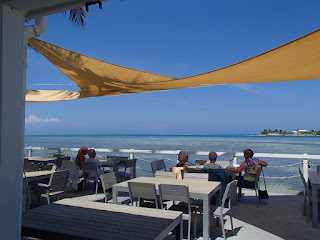 After showing George and Joann what we knew of the island (it was their first time) we decided to stop at Buddha's Bar and restaurant for a cold one. It was one of the hottest days we had all winter. 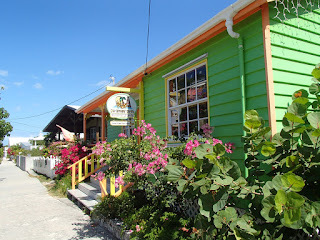 Buddha's is in a residential area, with an old school bus converted into a kitchen area. They have a small beverage store in the house and you sit at tables in the back yard under some sun protection screens to eat and drink with a large bar nearby. It was a great break after our long walk. 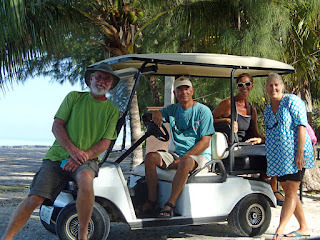 We decided at Happy Hour that since it was so warm, that we would rent a golf cart to see more of the island the next day. And what fun it was! At the park enjoying the shade. The man-made harbor at "Not Finished"
We came across a man-made cut in from the sound which had a cement harbor for numerous boats. There were not many boats there however. 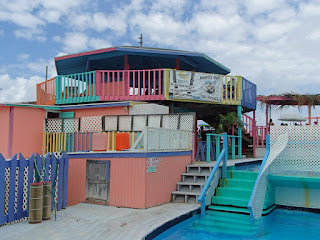 Then we noticed the sign in tiles as if it was the name for it, “Not Finished.” So typical of many places in the Bahamas. You can see why we wanted to walk this beach, just gorgeous! 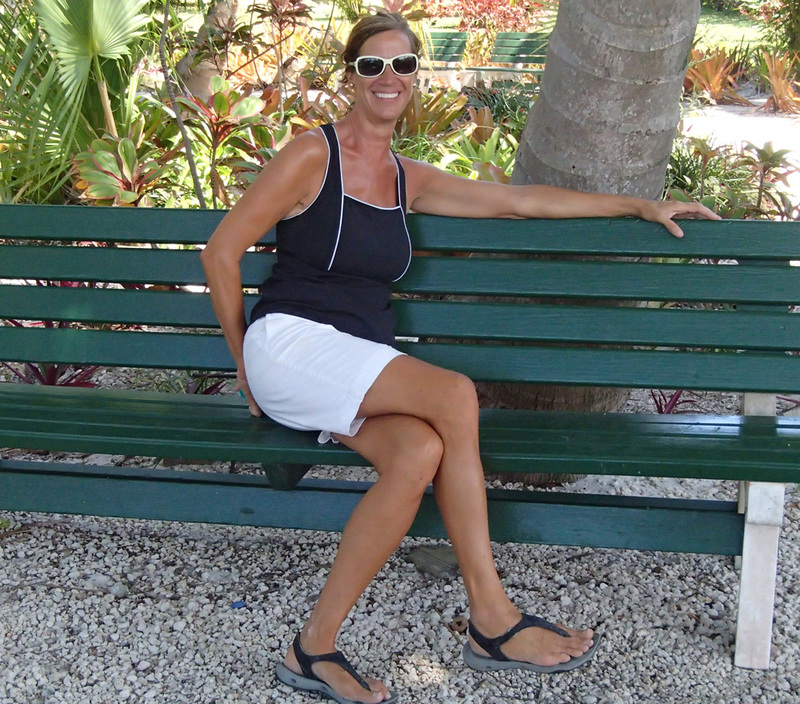 Joann and I wanted to walk the beach so we did that while the men enjoyed the shade at the park. We came across some men bone fishing. It is not a fish you eat. It is just for the sport of it. 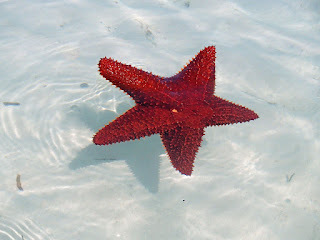 We also came across one of the large orange star fish near shore. You can see how clear the water is! This one must have been picked up by someone and so it was partially sticking out of the water. These are the most colorful starfish. 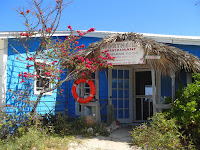 After our walk, we were getting hungry, so we headed to the south end of the island to eat at the Shipwreck Restaurant. Enjoying one of there many rum drinks! Once again a beautiful view and delicious fish! After lunch I wanted to get some fabric at one of the stores and the men were looking for lures for fishing. 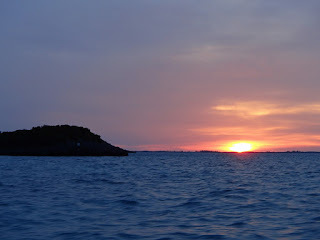 We were told about the Island Custom Rod & Tackle back on the north end of the island. They got exactly what they wanted and so did I. While at the store, Al waited outside and spotted this big tree. 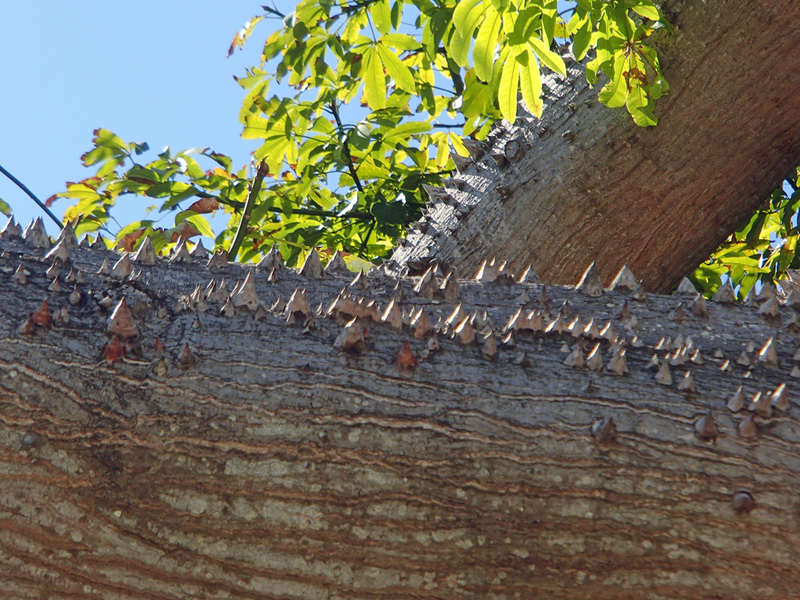 We have never seen one with thorns such as these! 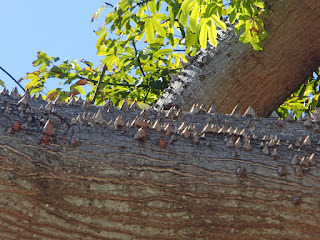 Would not one to climb this tree! There was also a pretty little park near a church where we stopped to take in the beautiful plants. We hit the grocery for a few things and I picked up a medicine you can get in the Bahamas but not in the states, called Sturgeron, which is good for sea sickness. I have had some problems on the crossings, with not feeling well, so people swear by it, so I am going to try it. Finally we took the cart back and headed to our boats. We motored about an hour to get to Royal Island and spent the night in the quiet harbor there so we had one less hour to go the next day to get 55 miles up into the Abacos. 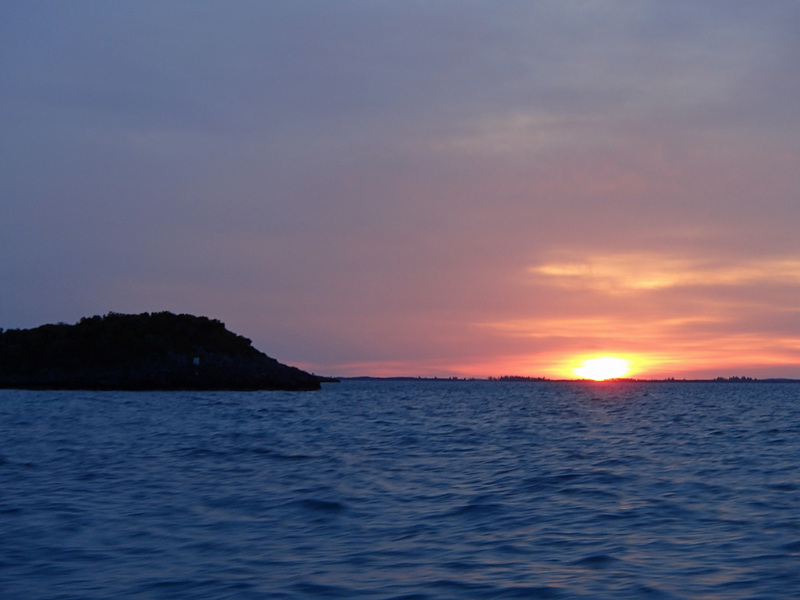 Sunrise departure out of Royal Island. 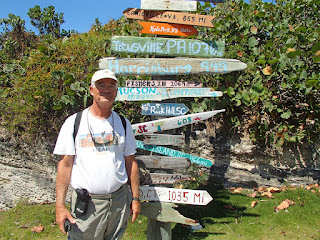 We left early the next morning and headed out into the Atlantic to get up to the Abacos. It was the gentlest waves we had ever seen on this stretch which made for a pleasant sail. The lures were in the water both on Blue Heaven and Bristol Cream. Al had two hits, but the first one was off before he could grab the rod. The second one took off but before Al could hook him he jumped out of the water and off the hook! At least we know that the skirts he got in Spanish Wells are more enticing than his previous ones. George landed another big beautiful Mahi. They had so much fish, they gave us enough for five meals and their freezer was packed! Not a bad way to fish, no cleaning, no mess on the deck!!!! Sturgeron affects or just a lazy sail? 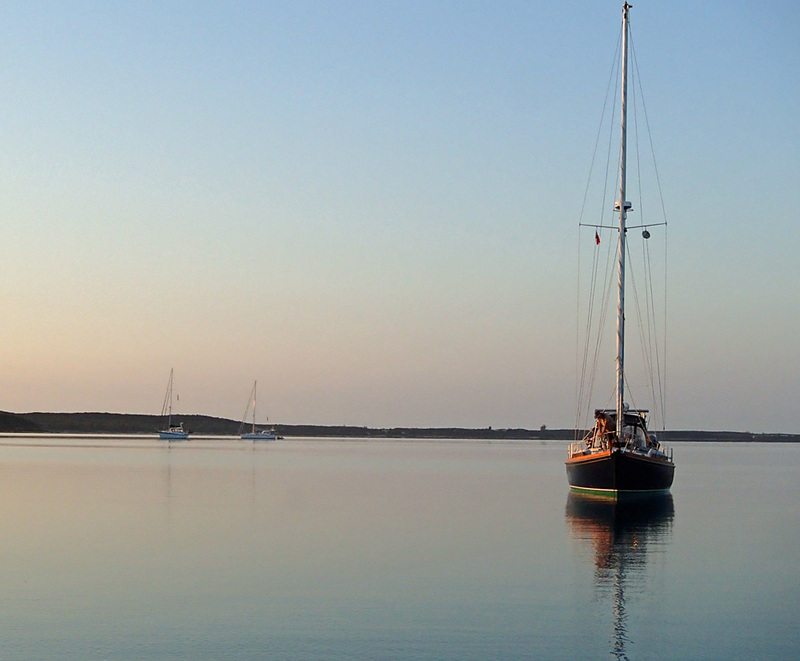 I had taken the sturgeron before we left in the morning but with the easy sail I really did not need it. I fell asleep and Al thinks it was the medicine. 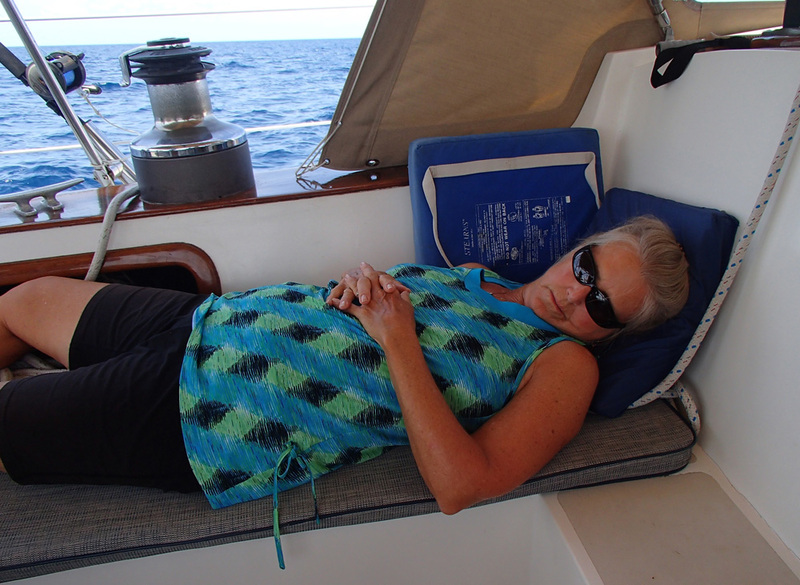 I think it was just a lazy sail and I fell asleep reading. I guess we will see, the next time I take it. Surprise, surprise, that night we had a delicious grilled Mahi dinner on Bristol Cream.Joann had bought some cinnamon buns in Spanish Wells and had put them in foil on the grill for a special dessert. Yummy! 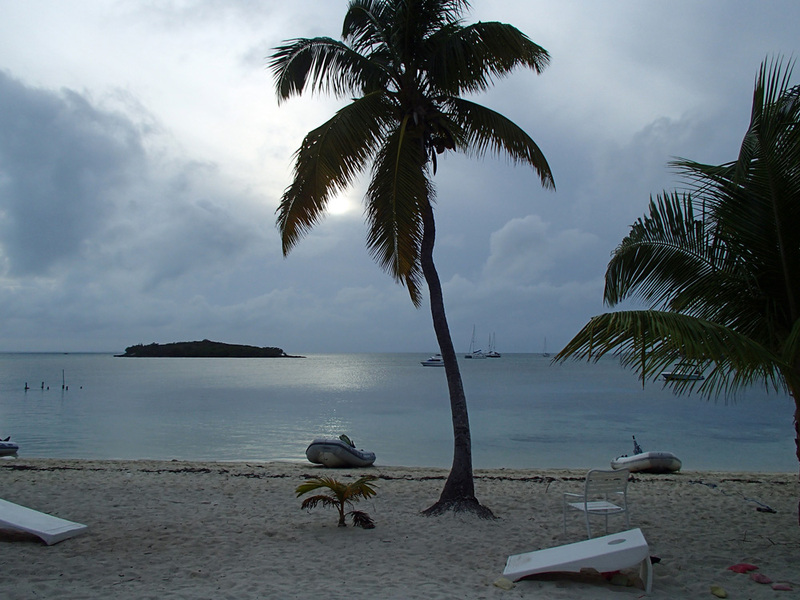 Indecisive, we altered between going to Hope Town and Marsh Harbor, and finally opted for Marsh Harbor because some unsettled weather was coming and it would be difficult to get moorings in Hope Town. We walked around Marsh Harbor giving George and Joann the lay of the land being their first time here. The usual happy hour on Bristol Cream later in the day. Awoke to rain and gray skies. It broke just enough to walk to Harbor Marina and had a good look around. That afternoon, George and Joann came for a friendly game of “Sevens.” We were good hosts by letting our guest come in first and second! The next day was also windy and cloudy. Walked to the grocery store for something to do and to get a few things. Made brownies and prepared a hot appetizer for Happy Hour on Escape Velocity whom we haven't seen for about three weeks. It was quite a spread and ended up being dinner for us. 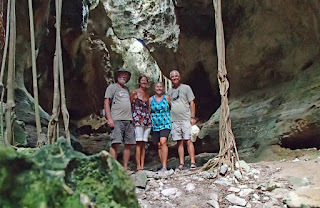 We also got to meet their friends Holly and Dan from Milwaukee and Yvonne and Joe on Madaki. A great time was had by all. 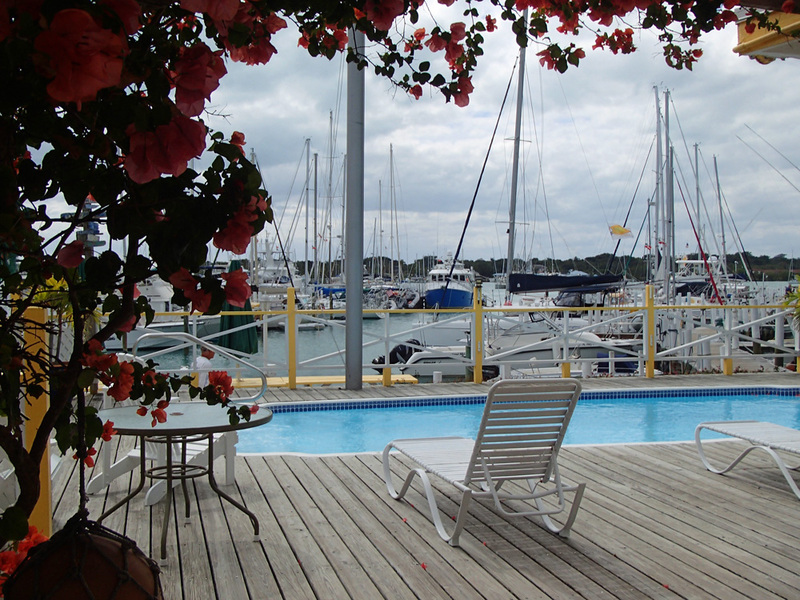 The Jib Room marina and pool. 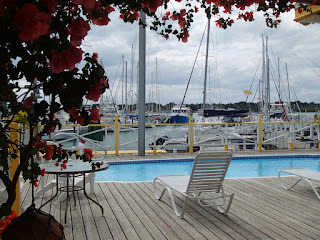 Joann and I walked all around Marsh Harbor the following day to the other side of the harbor to see a marina/restaurant called the Jib Room. It a nice smaller marina with a small pool and restaurant. 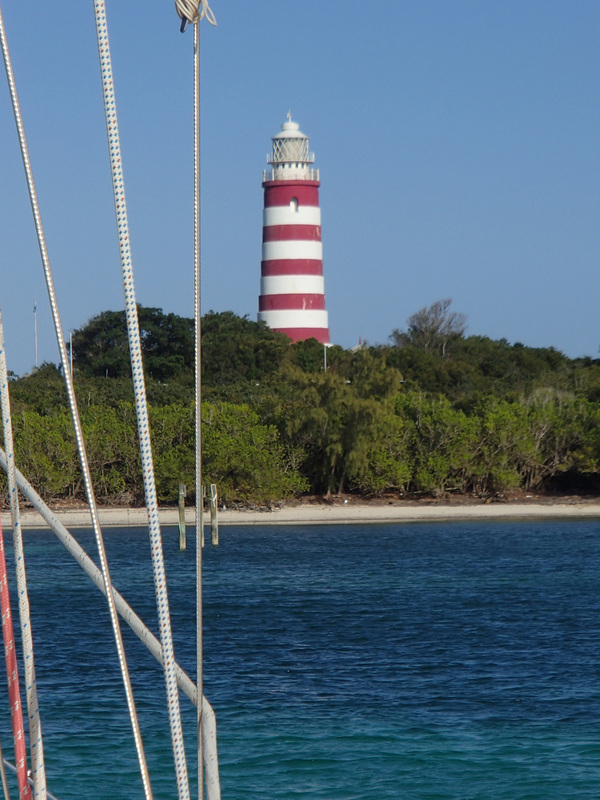 We also looked out on the Sea of Abaco to be thankful that we are in a safe harbor. We could not believe that people were snorkeling at Mermaid Reef, but when you are a tourist and only there for a week, they snorkel in all kinds of conditions! By the end of our walk we realized we walked for 3 hours. Now some of that time was spent in a few shops but not much. We also came across this sign along the road. Their must be some comics in their roads department! 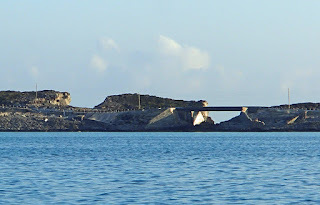 We headed over to Hope Town and anchored outside of the harbor right off the famous light house, since mooring balls were at a premium. 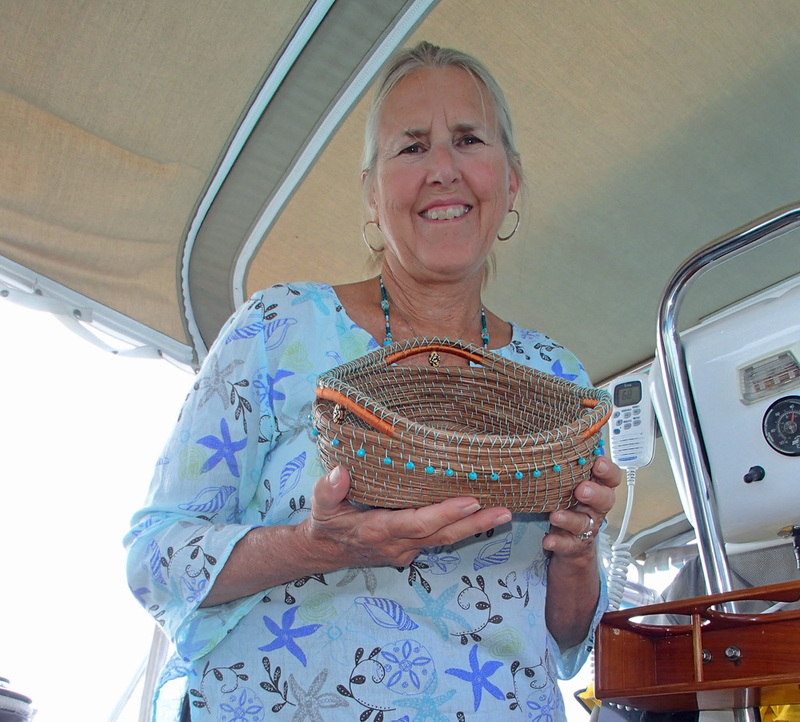 George and Joann had friends on a mooring ball who had been there for a month. They went to visit them, while we went into town to walk around and of course, shop. 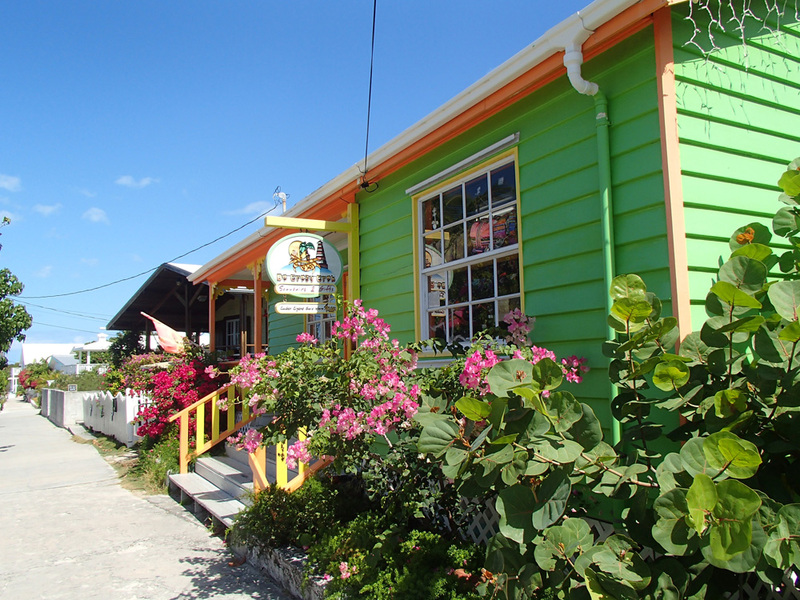 The cute streets of Hope Town. This is one of my favorite settlements. People really keep up there cottages and homes and the flowers are very nice, but it is visited by many tourists, so is more crowded than other places, especially due to being Easter week. 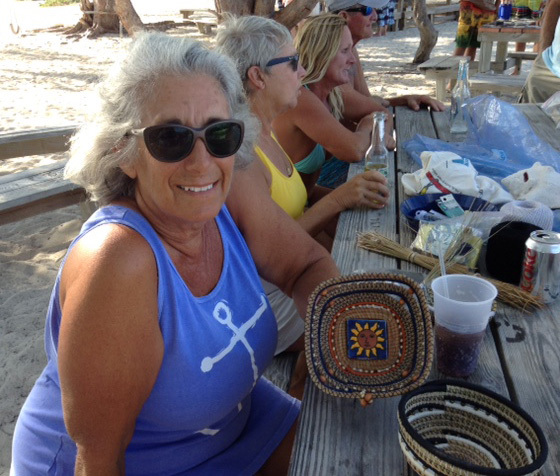 We met up with fellow cruisers whom we saw earlier in the season. Bess and Jim on Destiny so we decided to go to lunch with them. On the way we keep seeing all the signs cruisers and other tourist have put up for their home town distances. The closest we saw was Harrisburg which is about a 35 minute drive from Lancaster. 949 miles to Harrisburg, the closest town to Lancaster we found. 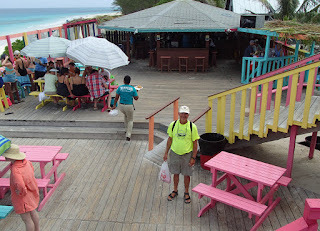 We had a good walk out to a restaurant on the Atlantic beach called On Da Beach. 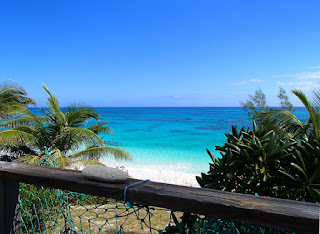 We had a beautiful view, a good burger and Mahi sandwiches, and a good time catching up with our friends. 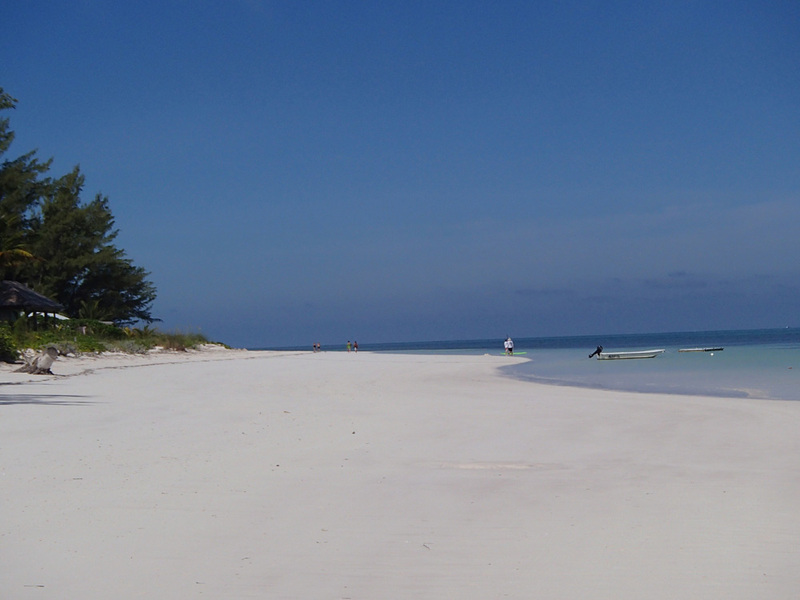 It was shorter walking the beach than the road. After lunch we walked the beach back into town, and Jim, Bess and I continued on further north to search for sea glass while Al enjoyed a bench in the shade. 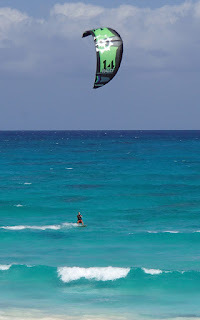 We also got a good view of a kite surfer doing his thing. Maybe in our younger days!!!! Meanwhile, George and Joann saw a mooring come available and got it for the week. They live on their boat so they are not as in a big hurry as us. 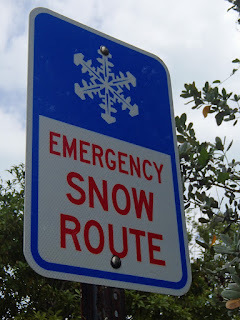 Our visas run out next Wednesday too, so we thought we would take this next weather window to cross. 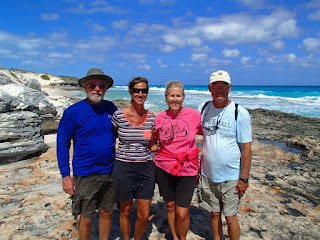 So we said our goodbyes and moved onto to Great Guana Cay the following morning. 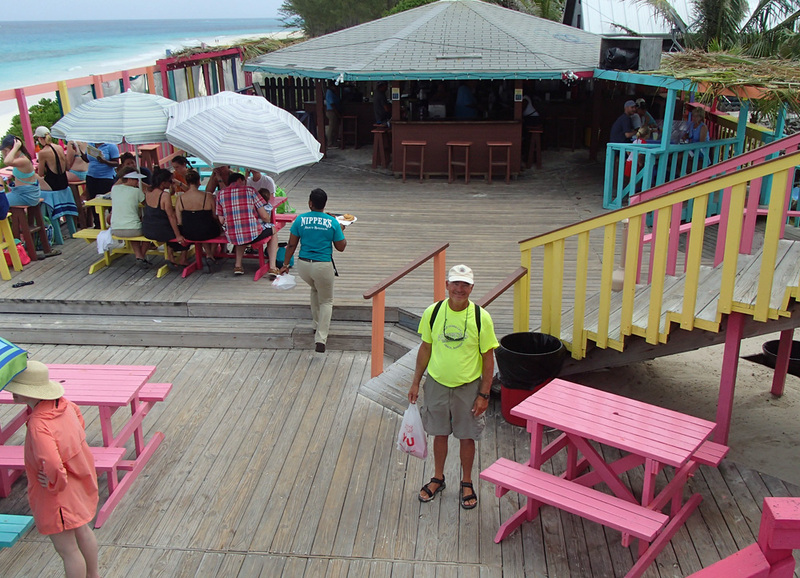 After lunch on the boat, we walked to the famous Nippers Bar/Restaurant where about a week ago they had the Barefoot Man Concert. We missed getting there by a day! Al on the deck at Nippers. He is in electric yellow! 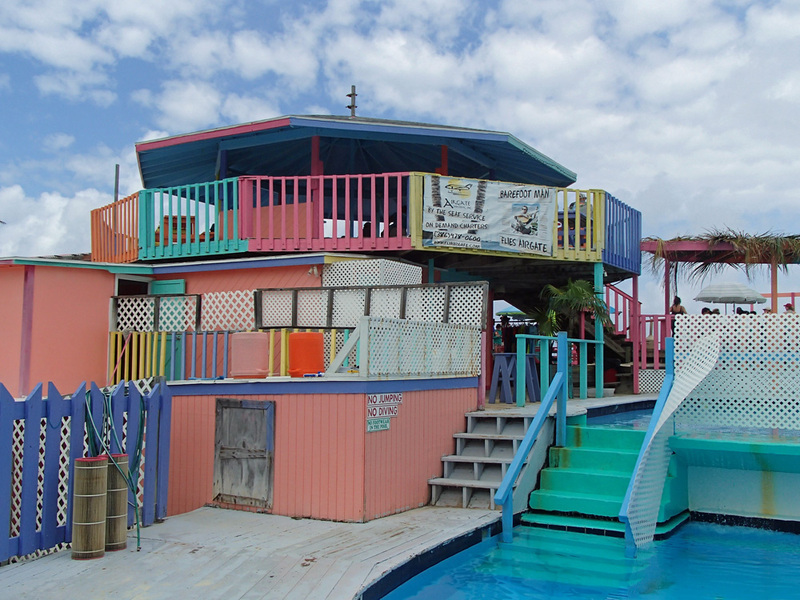 All the various decks at Nippers. It is a fun, several level bar with a beautiful ocean view, and pool area for the use of its patrons. 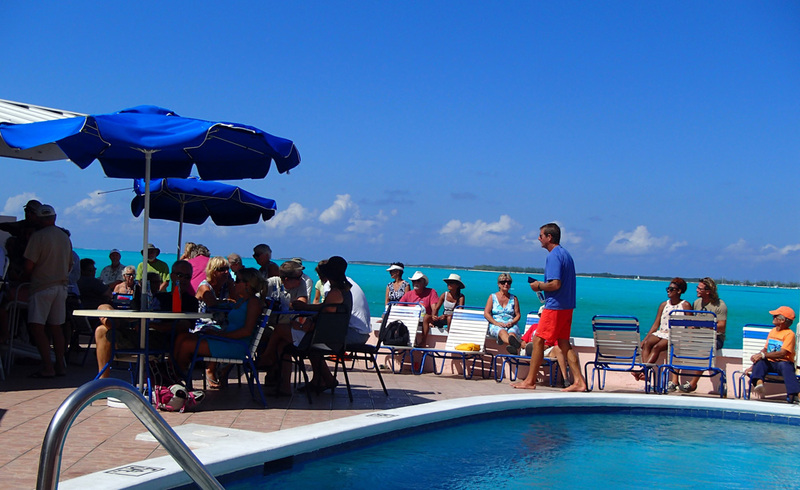 While sitting around the pool, our friends on Escape Velocity came up from snorkeling off the beach. 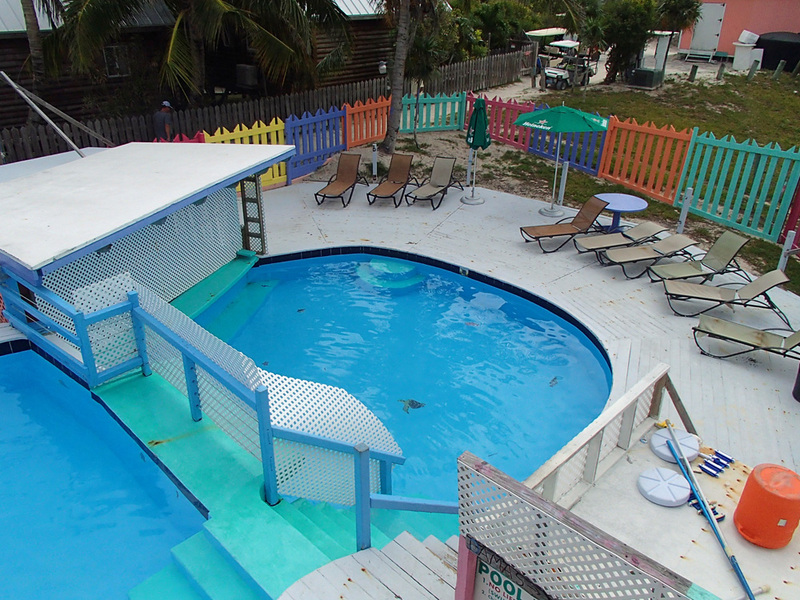 The empty pool at Nippers. 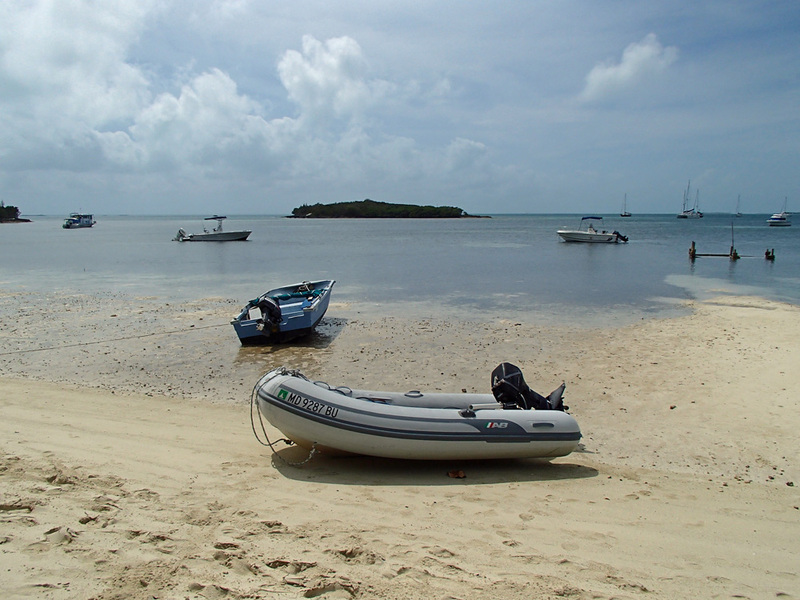 After leaving Nippers we came back to a very low tide, as you can see where our dinghy is. You would think we should know better by now. High and dry. It took some dragging! Later we met for a drink with Harry and Finola and their friends Holly and Dan, and then went into Orchid Bay Marina/Restaurant for Wing Night. Very delicious barbecue, jerk, buffalo, spicy garlic or sweet and sour wings. Eight for $5. We each added one side and that was dinner. A nice way to end our stay in the Abacos. And what a view out to our anchorage! 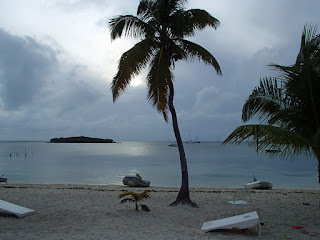 We were leaving in the morning to go to Great Sail Cay and cross Saturday into Easter Sunday. 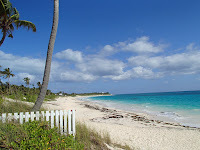 Hope to be in Vero Beach by lunch time if all goes as planned. This is 2017 tee shirt design. Well, winning wasn't in the cards for me (no pun intended) at the Texas Hold'em tournament, but I held my own for the longest time getting down to the last three tables when they started with seven. It was fun and that is what counts! 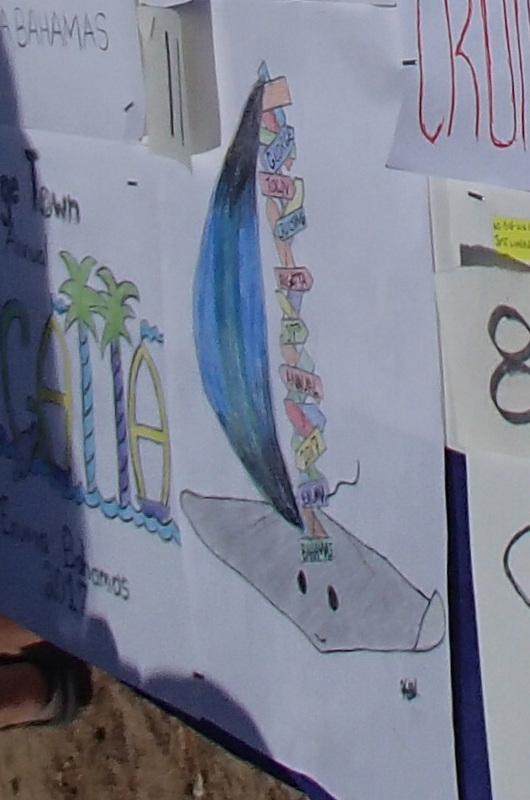 Also, my tee shirt designs did not win either. 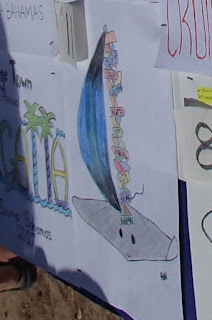 A fourteen year old girl's design won. 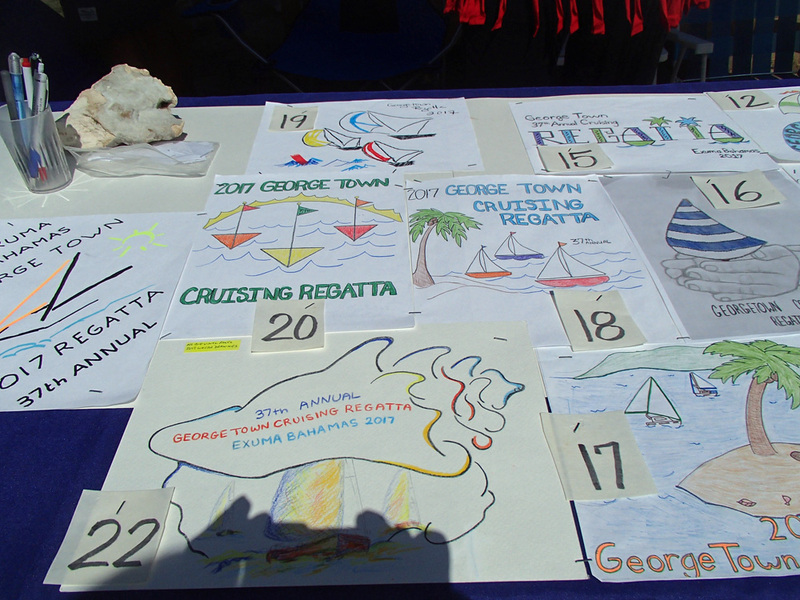 Some of the other entries. There were 24 entrants which is probably one of the most they ever had. People also said it was very hard to choose just one because so many were so good. I got a certificate for a free ice cream cone at Trinity's for entering. That was as good as winning the gold here in George Town because ice cream is very hard to come by! 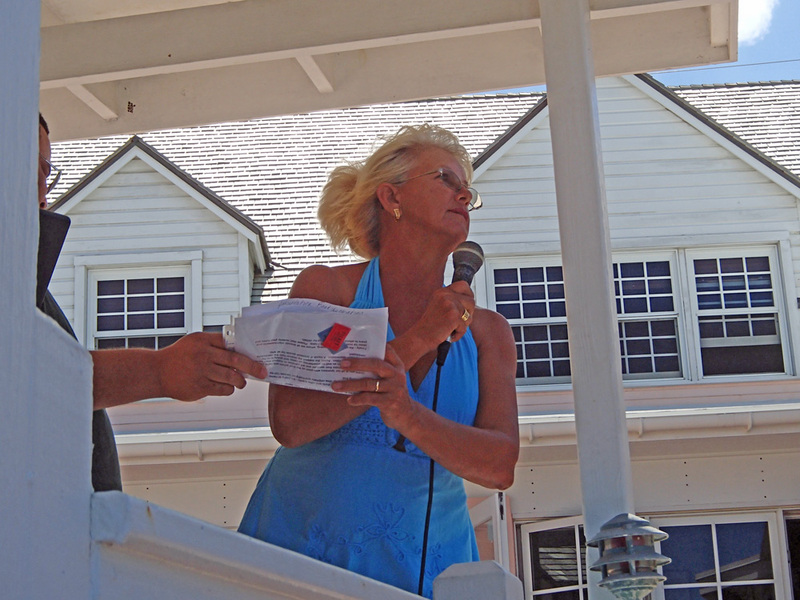 Jeannie, chair of Regatta, handing out awards. 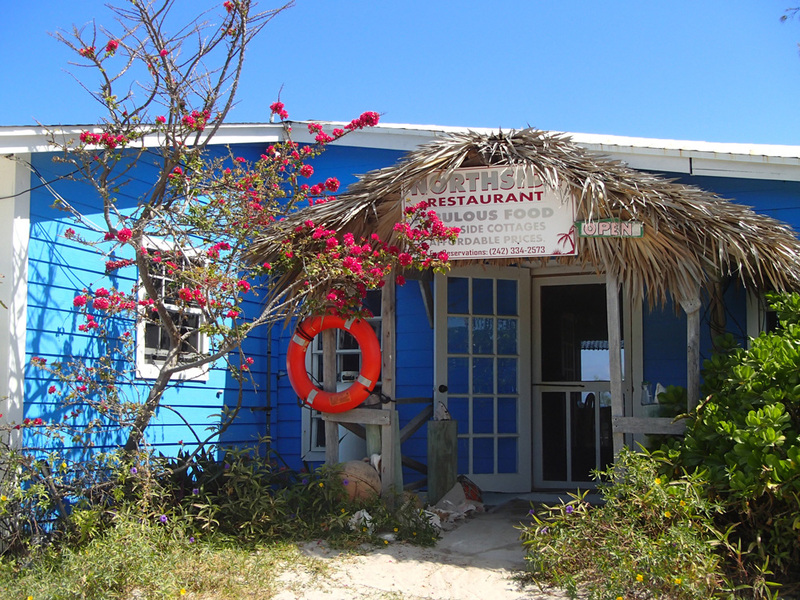 The regatta ended with a luncheon at the Peace 'n Plenty, a local resort. 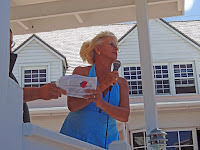 The awards of various flags were given out and lots of door prizes. Once again our luck was not with us and came away empty handed but had a good time with friends having lunch and listening to the Bahamian music around the pool. We usually leave George Town right after regatta, but it wasn't meant to be this year either because it was a week of 20+ knot winds. 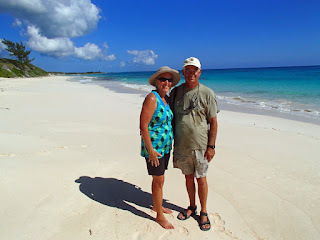 We stayed put at Sand Dollar Beach hiking the south end of the island once more, walking the beautiful beach on the ocean side with George and Joann on Bristol Cream and hunting sand dollars for which we were rewarded. 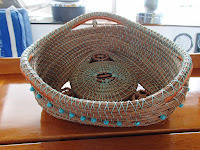 Most afternoons we went over to Volleyball Beach to meet up with friends and I would work on my pine needle basket. Prue on Exhuberant who got me started in Vero Beach at Thanksgiving finally made it across to George Town from Marathon. So she helped me with the finishing of my basket. 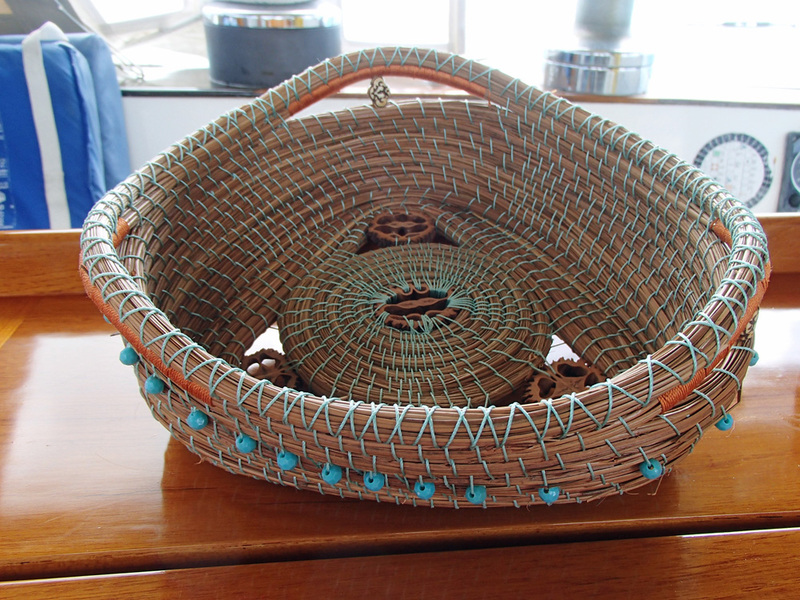 My pine needle basket creation. She also showed me some new stitches and how to wrap and add beads so that I could be more creative. 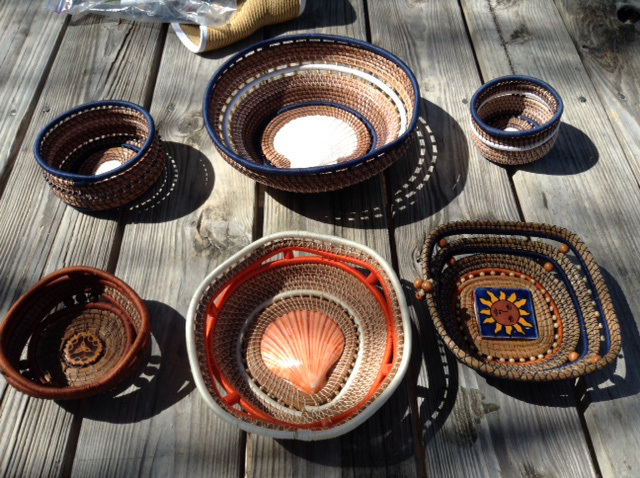 Her baskets are just beautiful and have given me much inspiration to do more! She has been at it a few years! Finally, on Friday we took Blue Heaven across to the town side so that we could prepare for leaving the next day. We got water, liquor, groceries, meat from meat market and fuel. 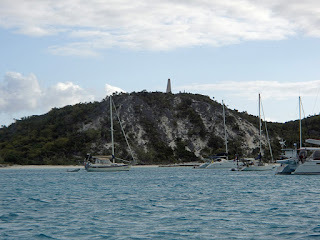 Passing by the monument, early in the morn to leave George Town. 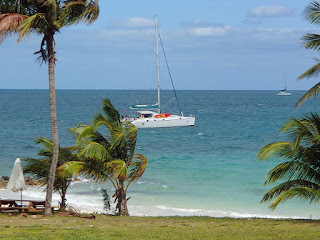 We left the next day with George and Joann with winds 18 to 20 knots to head north to Black Point. It was an aggressive sail (that means all I can do is read and not much else), and tried fishing once again, only to get nothing! Dotham cut to get into Black Point, was a bit frisky but not too bad compared to some past experiences there. While underway, I called ahead to Lorraine's to order her mother's coconut cinnamon bread and a regular loaf of bread. Her bread is delicious and such a treat. We got in around 4 pm and quickly went to the laundry to get some loads done, only to find out it was so busy all day that the water level was too low to start. Ida, the owner, said to come back at 6pm which we did. We ate an early dinner and came in to the laundry with our after dinner drink which we enjoyed from the deck watching the sun go down while our clothes and bed linens got washed. Things don't often go smoothly in the Bahamas, and with that tradition, when I put my second load in the dryer, put my token in and turned it on, the lights dimmed and I started smelling burning wires. So now Joann and I have two loads of wet wash with no more tokens! We walked to the local restaurant that sells tokens when Ida isn't around and asked if they would call and tell her our situation. About 10 minutes later her husband came by and gave us more tokens and finished our laundry with different dryers that worked. A happy ending to a busy day! Leaving the next morning, the cut was quite calm and once out we were able to sail until about noon when the motor came on so that we could keep going at least 5 knots. We had 55 miles to go to get to Rock Sound in Eleuthera and it is a long day. Fishing lines were out again on Bristol Cream and Blue Heaven. Two mahi for George, nothing for Al! We are going to be buying some more lures for Al when we can! We had a delicious mahi dinner on Bristol Cream. The next day we were ashore by 9:45am. 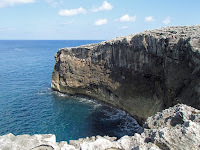 We walked to the Ocean Hole which is famous for all the fish that come in from the ocean to this spot. They are well trained for visitors and come to the surface as soon as they see the shadow of people on shore. They also go into a feeding frenzy when people feed them bread which some land tourist did while there. 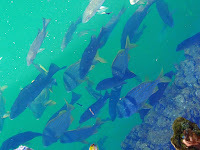 Unfortunately, we did not get to see many colorful fish, but interesting to watch. After visiting the Ocean Hole, we decided to walk across the island to the ocean side. We thought it was probably 2 miles but seemed a lot longer to the Northside Restaurant where you could cross. It was well worth the view! The beach was lovely although not great for finding treasures. 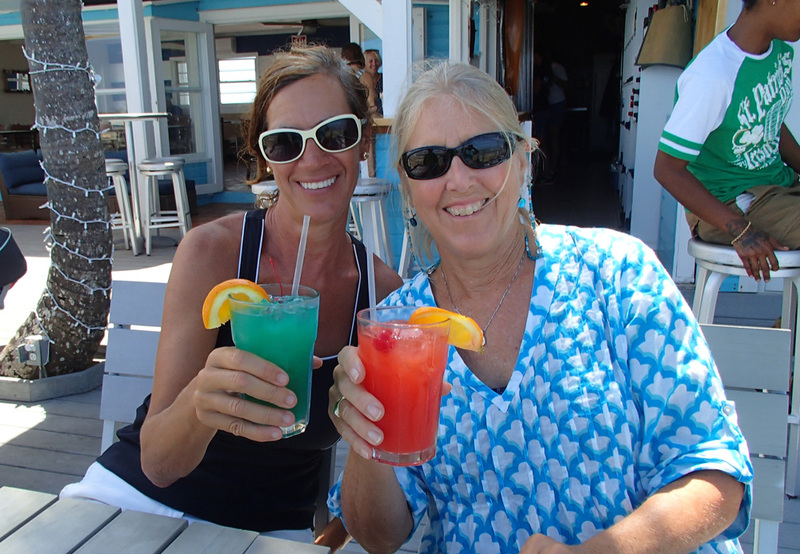 We enjoyed a cold one on the deck at Rose's Northside Restaurant while chatting with the owner. She is a lovely women who suggested she would drive us back to visit the cave which was next on our list. We were very grateful not to have to walk back because it was one of our first very hot days for the winter. 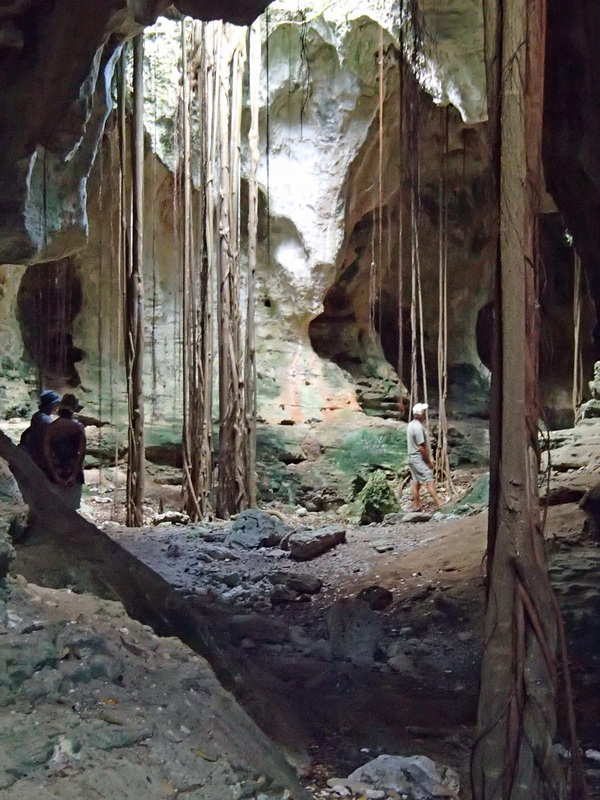 The cave is considered a Heritage Site in the Bahamas. 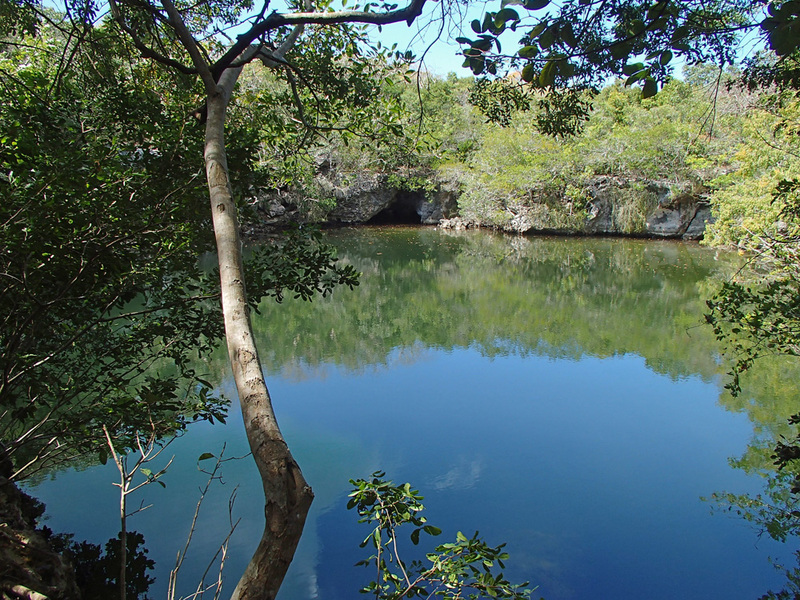 You first come upon another pretty little pond or hole, with some open caves at one end. 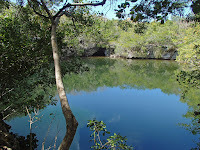 The start to the caves. You can see how large they are compared to people. However, they are not the neat caves. Continue on the path and you get to a spot where there is a ladder going down into the ground where the big caves are. We set the timer on the camera for this shot. 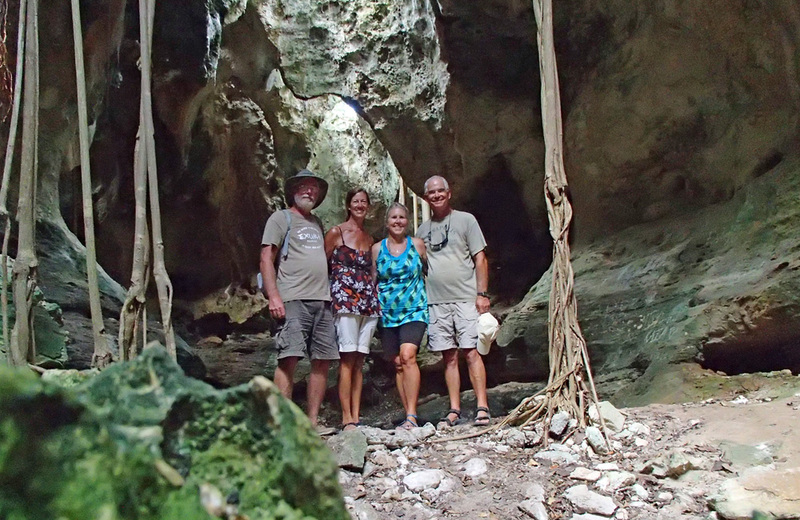 They were really interesting with roots from some of the trees going down through and opening from above that send shafts of light that show the beauty of the cave. It was a “cool”experience in more ways than one! Later that day, we had Happy Hour on Bristol Cream, with a few other boats who we knew from George Town. Andrew from Andante, Mark and Karen from Sea Vu Play and Jim and Nina from Agape shared a good time with us. It went later than normal, but we have to get used to the daylight savings time! Smooth as glass at Rock Sound. We awoke to very flat water and left to motor the to the glass window bridge located in north Eleuthra. 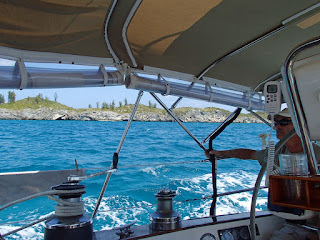 However, the winds picked up to 10 knots and so we had a nice motor sail off the coast of the island as we went. Getting an unexpected nice motor sail up the coast. 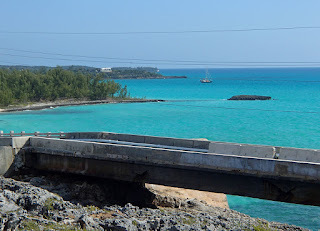 The Glass Window Bridge once was a natural arched bridge between the waters on the sound side of Eleuthera and the Atlantic on the other side. 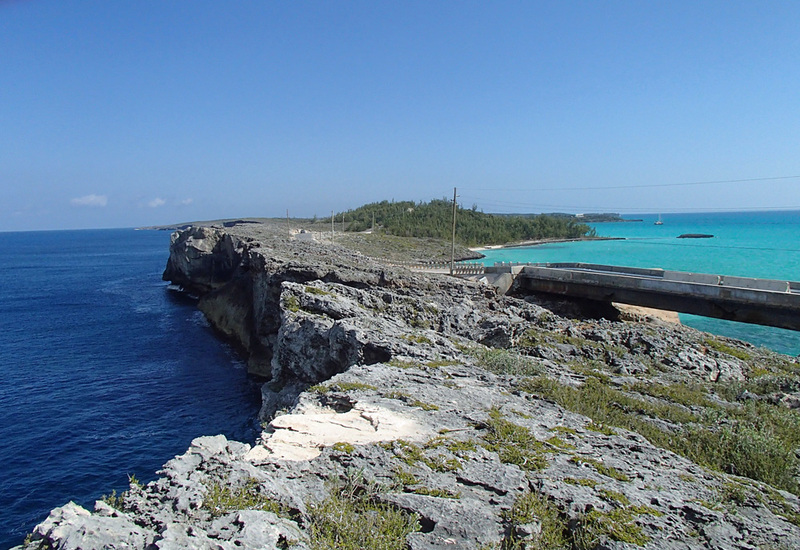 However, some violent storms wiped it out and so a man-made bridge was constructed. 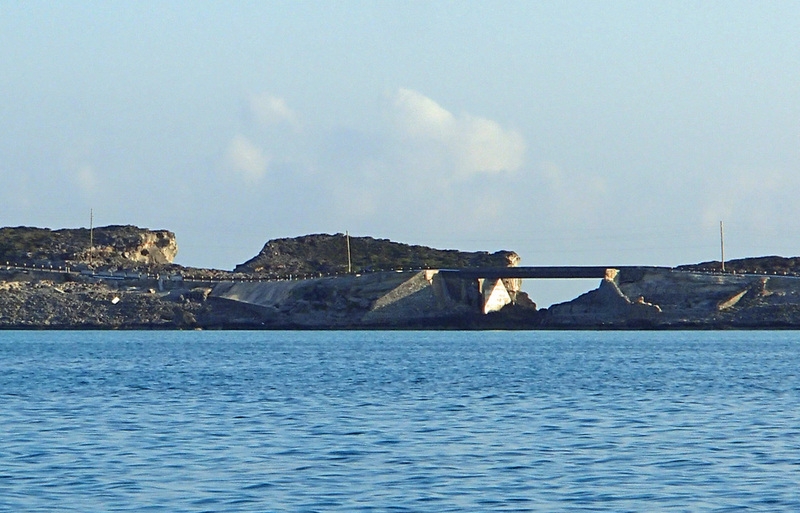 This is the bridge with Blue Heaven anchored in cove. Doesn't look like much. But take a few steps back and now you see the comparisons of the blues! It is so beautiful to see the turquoise waters of the sound and the deep blue of the ocean all at the same time if you get at the correct angle. A panoramic taken of the Glass Window Bridge. 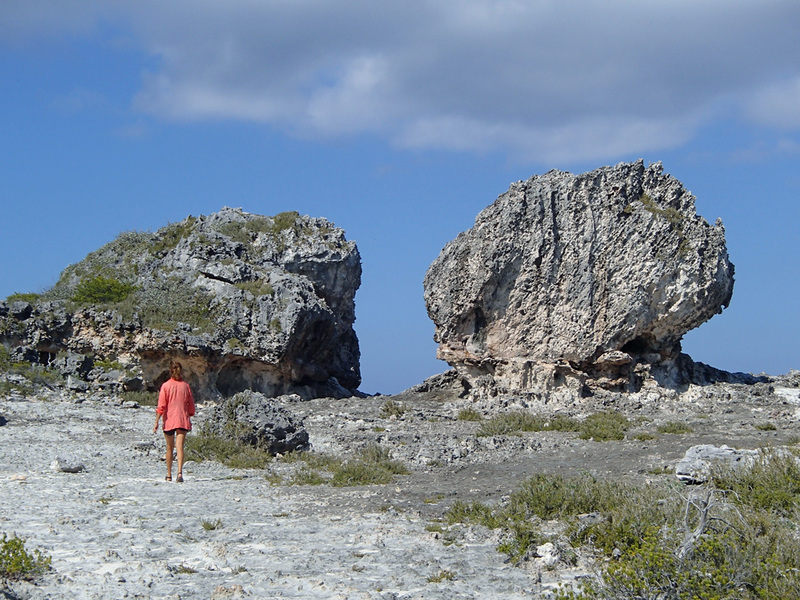 Also the two huge boulders south of the bridge are called the Bull and the Cow. They also were deposited there during another violent storm. Oh, the power of mother nature! The view on the other side of the Bull and Cow. View from the water of the Glass Window Bridge. Leaving the next morning I got a shot of the bridge as we passed by. 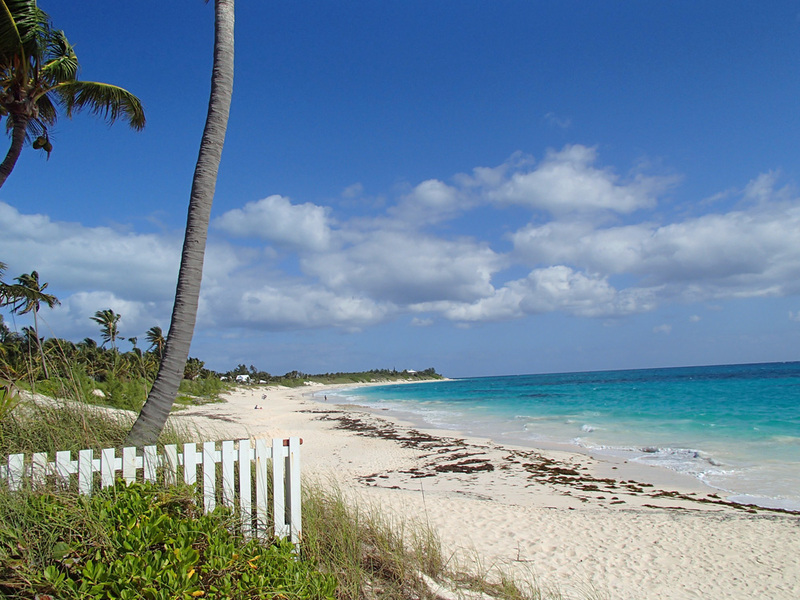 We are headed to Spanish Wells.